Malcolm’s Place and Wagyu Rib Eye Steak! Malcolm’s Place, one of the coolest place to hang out in Salcedo Village in Makati, next to Apartment 1B. 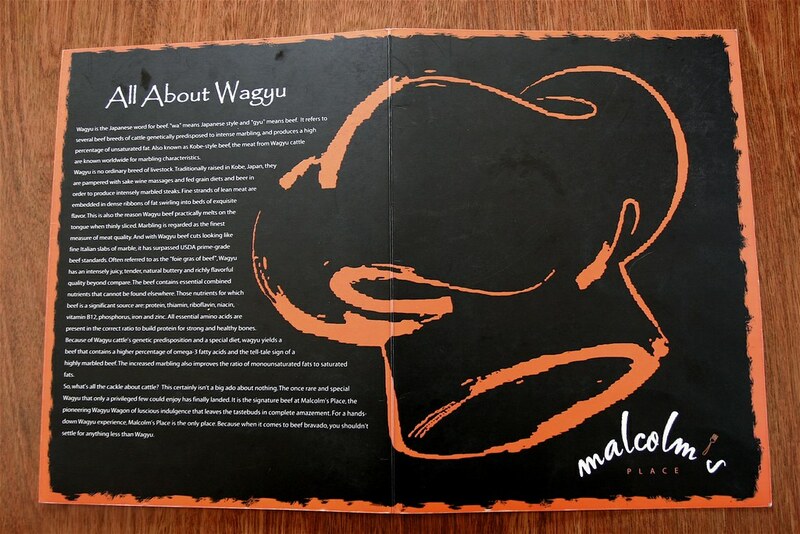 Named after Chef Malcolm, the resto’s claim to fame is their mouth-watering selection of Wagyu Beef. I came to a conclusion that if you really want to get the best Wagyu experience, you have to order the rib-eye. All the other wagyu dishes fail in comparison to the rib-eye and you will just be disappointed with the sirloin, striploin or the burgers. So your dilemma will start with its whopping P1,750 price tag. Fortunately, the meat was huge that it can satisfy three hungry carnivores on a tight budget. (Didi argued 3 hungry female carnivores) I didn’t really have to worry about this because the timing was just perfect. We celebrated the despedida of Chris for his China assignment and the bienvenida of Tina to my team. It is Wagyu Rib-Eye P1,750 or don’t try the other wagyu dish at all because they would just taste like over-hyped meat branded as wagyu. The Rib-Eye was soo good that it would satisfy your Wagyu fantasies of tender and tasty steak meat. Try to cut it as thin as possible to get that melt in your mouth experience. Apple Crumble Ala Mode (P125). Surprisingly, you can go to Malcolm even just for the dessert. I never liked Apple crumble ala-mode until I tasted Malcolm’s. This is one killer dessert that you got to try after that Wagyu steak to finish the meal with a bang. Cheers to a great service provided by the Malcolm’s Place staff! Glad you were open last April 9! Malcolm’s place is small with the first floor occupied by the kitchen and an overflow table. (L-R) Chris Alano, Ethel Blanco, Mui Ling Lee (our boss) and Tina Vaswani. This is the second floor of Malcolm’s. Limited seating so go there early to get a seat. This is always a good choice but don’t expect a fresh pumpkin taste. This was disappointing to carnivores like most of us. Surprisingly, this appeals to non-beef eaters or pescetarians. If you have to order pasta, order this Salmon pasta dish. Superb and definitely yummy! The wagyu steak tasted like discarded meat cuts from the rib eye. I should have ordered the burger instead. If you want to taste an over-priced and over-hyped wagyu steak then order the sirloin or the striploin. Sometimes, it is just not worth it to go cheap on your steak. Apple Crumble Ala Mode (P125). The killer dessert at Malcolm’s. I wonder who is the pastry chef? Coffee Crunch (P115). This is my favorite and this resembles a mini-version of Red Ribbon’s Coffee Crunch. 108 HV de la Costa Street corner Tordesillas St.
Nice pictures! I also read about this over at Annalyn’s blog. I can’t wait to try it out. Any recommendations aside from the Wagyu Rib Eye steak? Thanks! 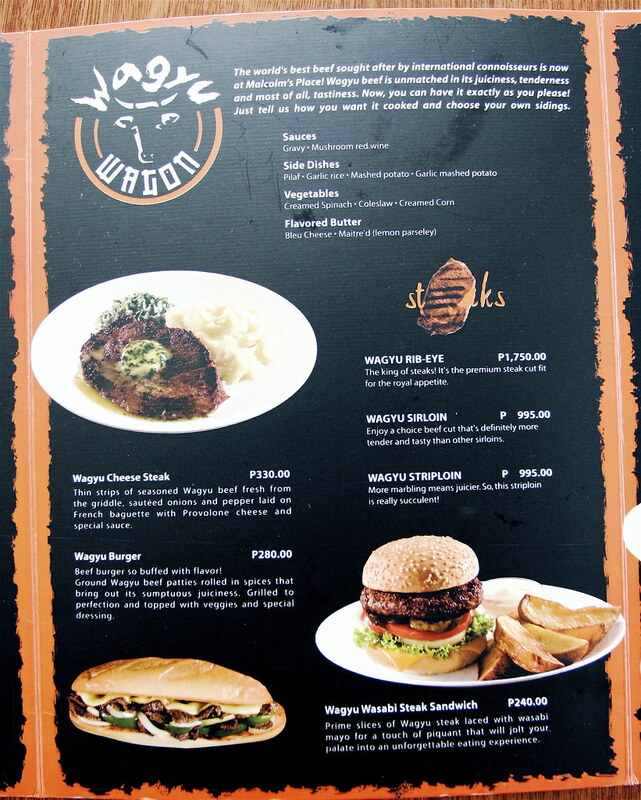 I first saw the place when it was calling itself Wagyu Wagon, glad to hear they chose a different name. Looking forward to trying this out with other carnivores. I don’t know, Anton. Photos are nice but sometimes I want to know what I’m looking at. There seems to be a proliferation of places that serve “Wagyu” steaks, either from Australia or the US. My complaint about these steaks primarliy concern the marbling, which can only be seen when the steaks are raw. The marbling on some of these steaks look more like that of Prime Angus, which is a big disappointment due to the fact that these can cost between 2 to 3 times more. The marbling of true Kobe beef, which gives it an almost white appearance, is what gives this beef its truly unique flavor and texture. That looks so good, Anton. Whats the price range? You have a great way of bringing out the yumminess in a food, Anton. Great. wow! is it cheap there? Wagyu is Kobe right? So I’m assuming – it’s going to be quite pricey. I can’t wait for the write-up! I’m aslo concerned with the portioning, because in the photos they look alright but maybe when I get there – it’ll be disappointingly small. Hehehe..
Ohmyheart WAGYU!! I want to have dinner there tonight!! eeeeeeee. Do I need to make reservations? what’s the price range per head? I have been trying to find a Wagyu Burger in Makati. Thanks. By the way, Just wanted to say, you have an amazing blog. The number of places you visit are just…a lot. :) And the pictures…great. So that’s what it’s about! Yes, this is also a short walk away from my place of work. hi anton! can you share to us the price of malcom’s food? worth it ba? For pick-up and delivery (pending location). Thanks for being the guinea pig again, Anton! 😉 I’d like to try this place for its non-Wagyu items, like the pasta or desserts and coffee. But for the price of that rib eye, and given that casual ambience, I’d rather go to Red for a chilled steak with a wider selection of side dishes and elegant surroundings. That wagyu certainly looks mouth-watering! And when I saw the “wagyu wasabie steak sandwich’, my tastebuds perked up until I read your review about it tasting like discarded meat. Zoiks! Sayang naman. Katrina, let’s go have some of that apple crumble and coffee crunch!! Hmm…you said that the steak fed three hungry carnivores, but then “good for 3” is relative. Can you say how many ounces or grams the wagyu rib eye steak priced at P1750 is? Anton! I finally tried this out!! The Waguy Rib-Eye was great! I thought it was huge! It was just ok. Good for 1 lang for me if you’re a meat eater. Available for pick-up and delivery also. If you’re interested, you can text or call them at 09176222580.
hmm is this the best wagyu beef for less than 2000 pesos? Tried it based on your recommendation. Very disappointing. Had the Wagyu Sirloin. Tasted like ordinary local beef with too much salt. All the steaks came out well done even though we asked for medium, medium rare. Also tried the salads, Wagyu burger and steak sandwich. Nothing great. Nothing tasted like Wagyu. On the plus side, the service was above average especially since we were in a big group. They didn’t miss a beat. oh no, so sorry! Only the rib-eye taste like the real wagyu taste. Tried the rib-eye last Saturday. Asked for medium rare but got it tough and overdone first time around. The staff offered to replace it and then proceeded to give me meat straight from the freezer. The center was still cold when served so I had to send the food back a third time. The worse thing is that the meat had no marbling at all. It didn’t look like rib-eye, and certainly not like wagyu that one expects for P1,750. Perhaps wagyu at 1,750 is just too good to be true? The staff was apologetic and sent a small cake to make amends. I’d have to say that I’ve been to Malcolm’s Place twice rcently for the wagyu steak and I’ve been happy and disappointed during my visits, respectively. My first visit to Malcolm’s I had the wagyu striploin, which I found most tender, flavorful and juicy. At the price of P 995.00 I was quite happy with it. My second visit to Malcolm’s was a total disappointment, having ordered the striploin I decided to splurge and go for the ribeye. It was one of the worst mistakes I’ve ever made. Not only was it more expensive (P 1,750) but it was tough. It was as tough as a regular local steak, dry, plus they overcooked it. I asked for medium well & they served it to me very well done. Definitely not very consistent in their quality. Not even an attempt to apologise properly, just had me fill out a comment card. Not going back and would advise anyone from ordering their “wagyu”. Ive been calling them to make a reservation but no ones answering! The pictures look yummy and mouth-watering. Did they change numbers? we tried to eat there with my girl friend. i ordered wagyu burger for me and rib eye steak for her. burger was good and not bad for the price but the rib eye steak was not tender and juicy its just like an ordinary steak that you can buy anywhere, were very disapointed cuz it was very expensive. i highly recommend the wagyu burger and steak in manny os hilton cebu. little bit expensive but were very satisfied! we will go there again SA NEXT PINAS BAKASYON KO! This place is a major rip off! I feel like I was robbed and deceived! This restaurant claims Wagyu is their specialty, one would therefore assume that their steaks are good, at the least. But be warned, I’ve tried better (and cheaper) local steaks for 1/10 the price! The steak I ordered (Wagyu rib-eye) was very tough! Three of my friends who also ordered Wagyu Rib-eye and Wagyu Sirloin were also very disappointed! My husband and I ordered an iced tea, a 230g Wagyu Rib-eye, and a 250g Wagyu Sirloin which came with soup and sidings. 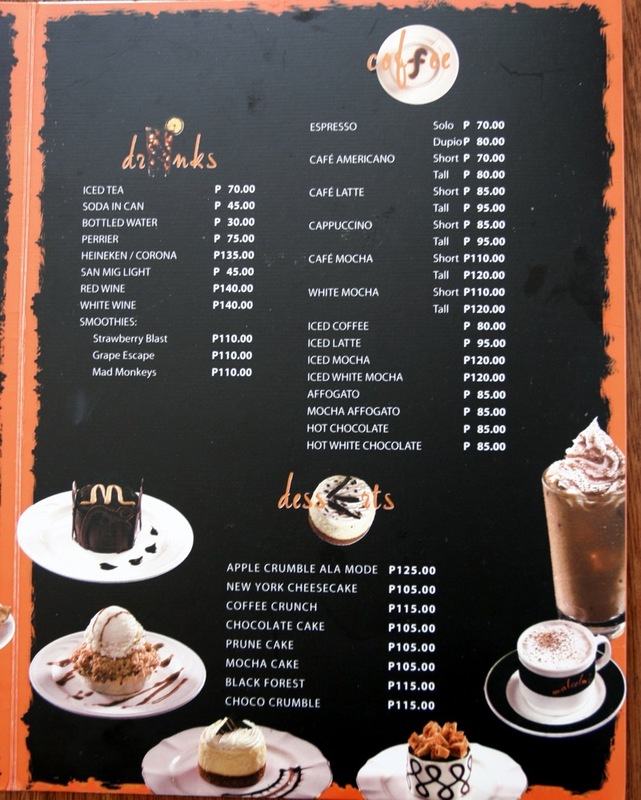 Our bill was P3,400! The pumpkin soup I ordered was too salty for my taste. I expected more plate presentation for steak that costs P1,750++. I felt cheated, even when the waitress gave us free coffee and a slice of chocolate cake (which wasn’t bad) after receiving negative feedback from us (about the steak). Maybe their pastas are better, but if you’re looking for good quality steak, this is definitely not the place to go. My friends and I trekked to Malcolm’s tonight as it garnered more good reviews than bad in your blog. Spent a fortune for steaks that tasted like local beef. 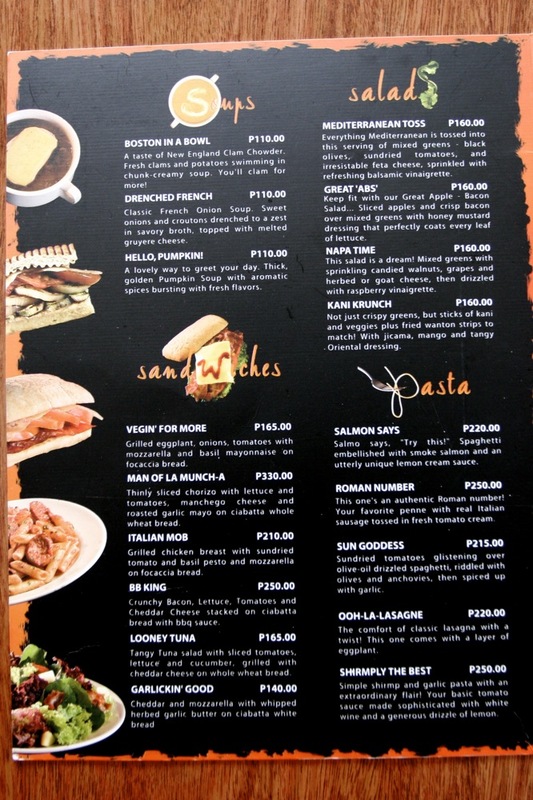 Ordered cuts were ribeye, sirloin and salpicao….all of them were “ma-litid.” Very disappointing! Myron’s (greenbelt5) Prime Rib Steaks are a million times better, and much more worth its price! Um yeah, because it’s shrimp not meat! Wagyu tastes great rare to medium-rare. Beyond that, mag angus ka na lang or mga prime cuts. Useless lang ang marbling kung ma overdone ang steak. Most overrated food ever – Wagyu burger. What’s the point? You’ll lose almost half the marbling once the burger gets onto the grill/griddle. Nasira na, sayang lang. “All the other wagyu dishes fail in comparison to the rib-eye…”- baka you mean PALE in comparison? How was it, Francis? Even if you have your wagyu medium rare, it’s still bad… that’s the way we had ours… SO, SO bad. SO, SO tough. I believe this blog is not reliable.